This new volume in the series Emerging Infectious Diseases of the 21st Century is a novel book on the role of microbes in the pathogenesis of common and disabling non-infectious diseases. New insights have emerged over the past several years suggesting that our commensal microflora of the gut is extremely important in regulating physiological and immune functions of the body. Covered are the perturbations of the normal composition of our endogenous microbiota, influenced by diet and genetic predispositions, as well as the mechanisms to produce common disorders such as obesity, diabetes, irritable bowel syndrome, colon cancer and atherosclerotic vascular diseases. Also explored is the evidence suggesting that predisposition to increasingly common afflictions such as asthma and multiple sclerosis is influenced, in combination with our genetic composition, by early life exposure to environmental microbes and the time of onset of common viral infections. Chapters provide the most recent information on these disorders with regards to epidemiology, current concepts on pathogenesis and mechanisms of their biology, recent research and data on the role of microbes, analysis of their validity and conclusive remarks and areas for future research. The Role of Microbes in Common Non-Infectious Diseases is an excellent resource for both physicians and investigators from a broad range of disciplines that will help to stimulate new concepts of disease pathogenesis and lead to the unraveling of their mechanisms of diseases and to novel treatments. Illustrations note 6 Tables, black and white; 7 Illustrations, color; XIV, 185 p. 7 illus. in color. This new volume in the series Emerging Infectious Diseases of the 21st Century is a novel book on the role of microbes in the pathogenesis of common and disabling non-infectious diseases. New insights have emerged over the past several years suggesting that our commensal microflora of the gut is extremely important in regulating physiological and immune functions of the body. Covered are the perturbations of the normal composition of our endogenous microbiota, influenced by diet and genetic predispositions, as well as the mechanisms to produce common disorders such as obesity, diabetes, irritable bowel syndrome, colon cancer, and atherosclerotic vascular diseases. Also explored is the evidence suggesting that predisposition to increasingly common afflictions such as asthma and multiple sclerosis is influenced, in combination with our genetic composition, by early life exposure to environmental microbes and the time of onset of common viral infections. Chapters provide the most recent information on these disorders with regards to epidemiology, current concepts on pathogenesis and mechanisms of their biology, recent research and data on the role of microbes, analysis of their validity, and conclusive remarks and areas for future research. The Role of Microbes in Common Non-Infectious Diseases is an excellent resource for both physicians and investigators from a broad range of disciplines that will help to stimulate new concepts of disease pathogenesis, and lead to the unraveling of their mechanisms of diseases and to novel treatments. Ignatius [Bill] Fong is a Professor of Medicine at the University of Toronto and he is an author/ editor of 8 previously published books on Infectious Diseases. His research interests include topics in clinical infectious disease, HIV infection, and microbial-induced or -associated atherosclerosis. Irritable Bowel Syndrome and Microbial Pathogenesis.- Microbes in Colon Cancer and Inflammatory Bowel Disease.- The Role of Microbes in Obesity.- Microbes in the Pathogenesis of Diabetes Mellitus.- Asthma and Microbes: a New Paradigm.- Chronic Fatigue Syndrome: Searching for a Microbial Etiology.- Can Microbes Play a Role in the Pathogenesis of Alzheimer Disease?- Multiple Sclerosis and Microbes.- The Role of Infections and Microbes in Atherosclerosis. 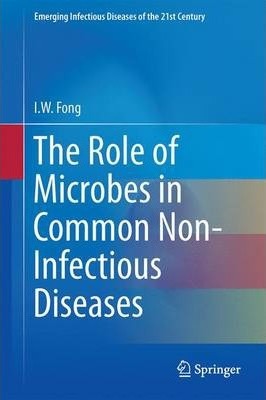 Ignatius [Bill] Fong is a Professor of Medicine at the University of Toronto and he is an author/editor of 8 previously published books on Infectious Diseases. His research interests include topics in clinical infectious disease, HIV infection and microbial-induced or associated atherosclerosis.